Nothing that can be recycled should be going into landfill. By recycleing, reusing and upcycling we can save an estimated 17kg per month (200kg per year) of C02 a month. Recycle everything you can. Anything made from metal, wood, most plastics, paper and cardboard, and electronic e-waste are all likely to have a recycling option. We have searched the web for easy DIY’s and upcyling projects to save you time and energy, that you can invest into you new project. Check out our 3 favourite projects for this week! Old T-shirt to handy knitted bag with Delia Creates. Got an old shirt? How about turning into a brand new netted bag? Delia has created a very easy DIY project here, with very little sewing and very little fuss. Sounds like our kind of upcycling! Head of to Delia's page and be inspired. Coconut planter with Upcycle That. I LOVE this DIY project. I go through a lot of coconuts thanks to the convenient Thai-grocery store down my street. This coconut planter takes about 15 minutes to make and looks amazing. Old bathtub to retro couch with GreenMoxie. I'm having a few Breakfast at Tiffany's flashbacks looking at this one. 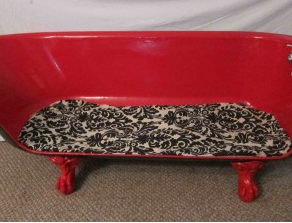 Turns out it's pretty easy to have a Holly Golightly-esque couch, all you need is an old tub. This DIY post will show you everything you need to know. Including how to attach claw-feet to your tub. You can also check out last weeks favourite DIY's by clicking here .